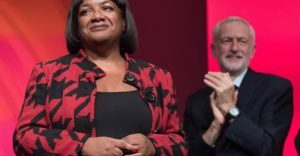 From Morning Star: The Tories are shamefully fabricating a “mini-riot” over whether Jeremy Corbyn called Theresa May a “stupid woman”, say senior Labour figures. Deputy Labour leader Tom Watson and shadow home secretary Diane Abbott said the row was overshadowing the rest of politics with fewer than 100 days until Brexit. During Prime Minister’s Questions on Wednesday, TV cameras had caught him saying something inaudible to those opposite him after Ms May likened his tabling of a confidence vote in her to a Christmas pantomime, while making panto-themed jokes. Opposition MPs had criticised the fake outrage over the allegation of misogyny that a number of prominent Conservative MPs were themselves guilty of, or worse. Mr Watson told Good Morning Britain that it’s “not great” to be focusing on what “Jeremy did or did not say” while elderly people are lonely over Christmas and face losing free TV licences. This morning, Mr Corbyn accused the media of being “utterly obsessed” with what he said. “The fact that a homeless man died outside Parliament has got no coverage whatsoever, and it should,” he added. "The Tories’ rebranding won’t wash: being green is about more than fluffy bunnies"